Learn More About Starting a Home-Based Travel Agency Today with Cruise Planners Through a Special Webinar Invite. So, what’s it like being a work-from-home travel agent? Here we break down this dream job and let you hear directly from a Cruise Planners franchise owner on what it’s really like being a work-from-anywhere travel agent. Because of Cruise Planners’ technology, I can live my personal bucket list while owning a growing and successful travel business. In the past four months, I’ve been to Mexico twice, taken a cruise, and toured Ireland. No job on the planet offers this flexibility to travel and still earn an income! The flexibility of working from home is amazing. My schedule allows me to attend all my family’s activities, I get more work done by eliminating a commute, and I can handle the occasional client call during travel. I have everything I need to help them with Cruise Planners’ mobile technology. Cruise Planners provides us with the fantastic benefit of a “business in a box” for all the back office, IT, and marketing functions we benefit from as franchise owners. I don’t have to worry about all the support functions and departments you need to run a successful business. We have access to a support coach who helps us set goals and grow our business, an amazing community of fellow franchise owners, automated accounting reports and commission payments, and several in-person learning opportunities throughout the year. Do You Actually Travel as a Travel Agent? I “travel what I sell,” so that means our family vacations include trips to Europe, river cruises, all-inclusive resorts, ocean cruises, Hawaii, Disney, rafting on the Colorado River … and that’s just in the past year! We even have access to discounted travel. Real Talk: What Would You Tell Someone Considering Becoming a Travel Agent? Like any business, it takes time and effort to be successful. You need to treat this like the business it is and set yourself up with a functional, professional office space in your home. You need to educate your family that you are working, not just surfing the Internet looking at beach resorts and flights to exotic destinations. You can establish office hours, but you also need to realize this is a customer service business. Sometimes you will need to be available outside those hours to be successful. Cruise Planners helps you each step of the way. Cruise Planners travel agency franchise continues to help a nationwide network of franchise owners take control of their work/life balance and prioritize family time, all while living their passion for travel. If this sounds like the career and lifestyle you’ve been looking for, check out this link for four ways you can find freedom and flexibility as a work-from-home travel agent and watch this exclusive on-demand Work-From-Home Parent Webinar hosted by Cruise Planners. How can I start becoming a cruise planner travel agent? I am a mother of two and it’s really hard for me to apply for a job away from home. Looking for a job to be at home with three small kids but make an income at the same time. Need lots of flexibility with hours. Cruise Planners allows you to work from home while making money on a flexible schedule. 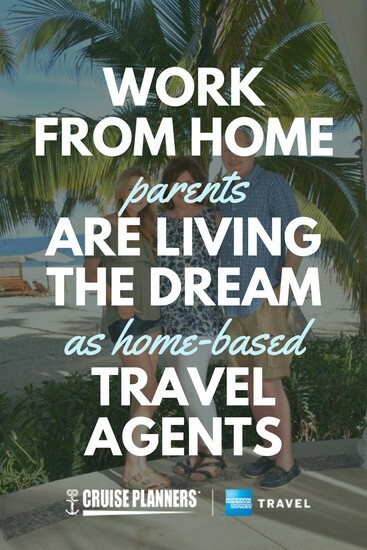 If you’re interested, you should sign up for their free webinar to see if being a home-based travel agent is your calling.